The hotel is a privately-owned small hotel in the city centre. Guests will find plenty of restaurants, bars, nightclubs, shops and public transport here. Ateneum Art Museum and Temppeliaukio Kirkko (The Rock Church) are within 1 km of the hotel. In addition, the beach is only around 3 km away and ski slopes are 10 km away. 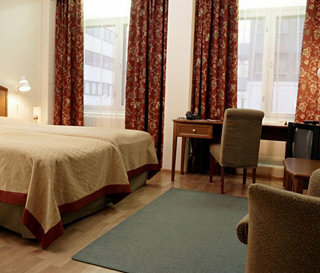 Helsinki Vantaa Airport lies around 20 km away.The 4-floor hotel features 44 guestrooms and offers a 24-hour reception, safe, currency exchange, 2 lifts and conference facilities. Further facilities include a TV room, breakfast room, restaurant with a non-smoking area, room and laundry services (fees apply).The rooms are decorated in light pastel shades with wooden floors and modern light wood furnishings. All of which include a desk, telephone, an en suite bathroom, a hairdryer, a radio, Internet access, central heating and a TV.Guests are able to unwind in the sauna.A breakfast buffet is served each morning and lunch can be selected from the set menu.